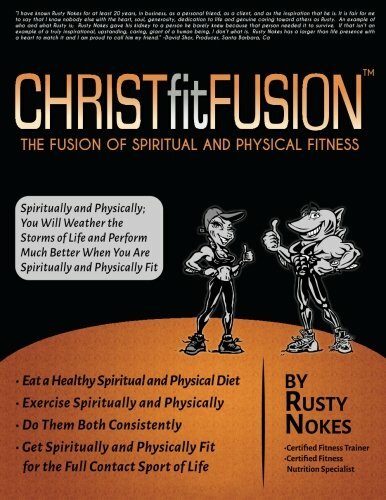 Written by veteran personal trainer, Rusty Nokes, Christ Fit Fusion - The Fusion Of Spiritual and Physical Fitness delivers an insightful and challenging perspective on getting fit. Spiritually and physically, have you yo-yo'd, gotten weak, had moments of strength, experienced success, fallen for a lie, gotten discouraged, but always known down deep there was truth and a missing link somewhere? You can change your future in 31 days by following the Christ Fit Principles of 1). Eating a healthy spiritual and physical diet 2). Exercising spiritually and physically and 3) Doing them both consistently. Live the right lifestyle and the results will take care of themselves. This excerpt sums it up: It's FREE! And ANY "BODY" can do it! Whether you're young, old, out of shape, disabled or have six toes. It doesn't matter. Fitness is for you and just like salvation, it's Free. It's also very simple and doesn't require a lot of fancy equipment or expensive memberships. But just like Christianity it gets too complicated. Although the message is "simple" the follow through is one of the hardest, most challenging yet Rewarding things you'll ever do. The journey is full of trials, tribulations, pain (both good and bad), perseverance, successes, failures, plateaus, growth, and letting go of some selfish pleasures, but ultimately it leads to Victory! Are we talking about salvation or fitness here? You tell me. It applies to both. Rusty was raised in Searcy, Arkansas and is the oldest of three. At an early age Rusty recognized his competitive spirit and always challenged himself mentally and physically. By the time he was 14 he was already the fastest back stroke swimmer in the state! Being raised mostly by his grandparents, Rusty understood the effects of war as both his grandfathers served in the military. Living under that type of authority instilled a standard of serving of which only the military combined with a Christian environment is capable. At 17 he enlisted with the National Guard as an Infantryman. He served for six years while also attending Harding University. After graduation, it wasn't long before he was accepted into the Little Rock, AR police academy where he graduated second in his class. It was during this time in his life Rusty discovered fitness as a true passion. He began training to become a body builder. Once again he succeeded and won first place in his weight class as novice and fourth in the open class a couple years later. People working out in the gym started asking him about his training and offered to pay for his assistance in their own training. Thus began the fitness training journey. Rusty moved from Arkansas to California and while there certified as a personal fitness trainer through I.S.S.A. (International Sports Sciences Association) and operated his own mobile fitness business called Fitness to You. He was highly successful and trained clients of all ages, all walks of life, and all having varying fitness challenges. Even though Rusty grew up going to church, it wasn't until this time in his life that he had his divine encounter with Jesus and became His follower. He attributed the success of his business to his walk with The Lord. After years training clients off and on in various roles, Rusty came to the realization that the &#x201c;clipboard&#x201d; approach didn't seem to help anyone move towards the lifestyle change he knew they desperately needed. Only The Lord could make that type of dramatic change. It was out of his desire to truly help people find The Lord and get fit that Christ Fit Fusion was birthed. Currently Rusty lives with his wife Amy Jo, his two sons, Dillon and Cameron and his two step children Austin and Grace in San Antonio, TX.